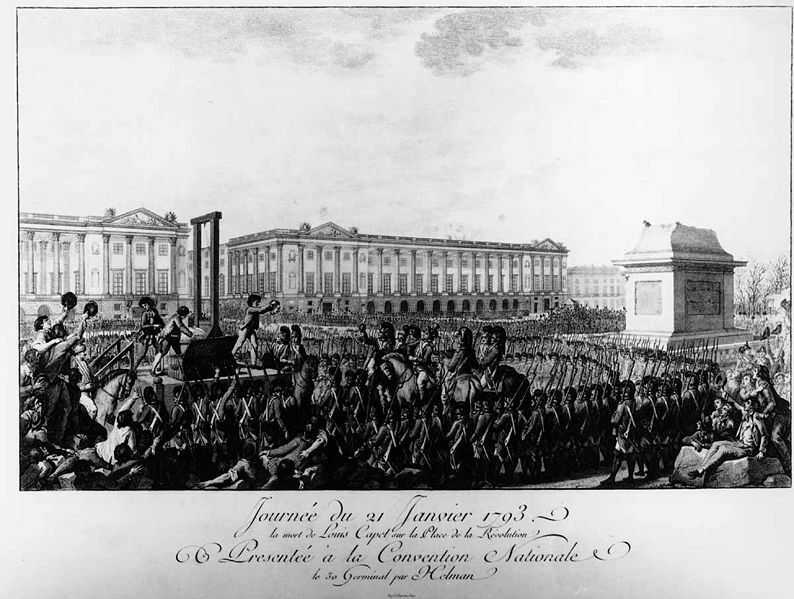 January 21 marks the anniversary of the execution of Louis XVI at the place de la Concorde in Paris. 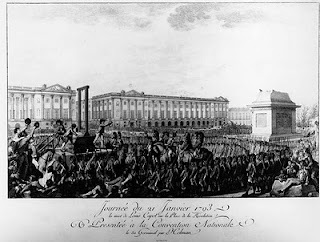 His final words were, "Peuple, je meurs innocent! Je pardonne aux auteurs de ma mort! Je prie Dieu que mon sang ne retombe pas sur la France!" A notable occasion in history. A notable occasion in my personal history for the major social boo-boo(s) I made when I first learned of the importance of this occasion from someone who takes it very, very seriously. p.s. No, he never called back. 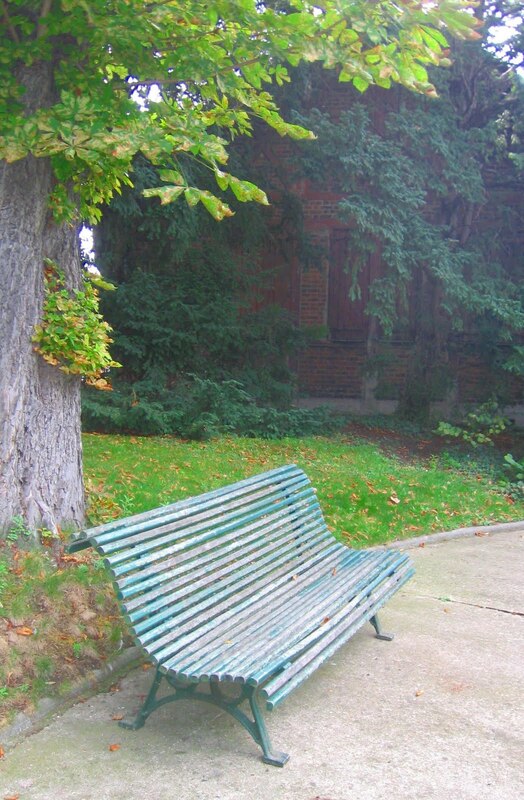 If you've never visited le Jardin des Serres d'Auteuil, you are missing out on a sublime, tranquil bit of Paris. 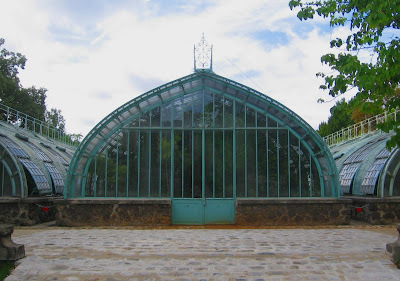 It is the Botanical Garden of Paris, with a magnificent 19th-century greenhouse and acres of lush greenery, statues and endless moments for quiet reflection, located in the 16e arrondissement. How could I not fall in love with this place the first time I saw it? 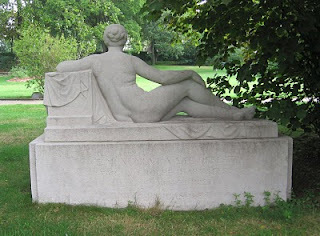 I discovered the garden one day when scouting out its neighbor, the Roland Garros stadium, home of the French Open -- what we anglophones call the French Open, that is. In France, the annual June world tennis championship is simply called le Roland Garros. I've been reading news bits here and there that the Federation of French Tennis has been complaining that the mega-event is outgrowing its current home, and has been contemplating a move. Harrumph, I thought. How can you have the Roland Garros if it's not at le stade Roland Garros? Ha. At least, that was my opinion until I learned of the New! Exciting! way to save the Roland Garros/French Open and keep it at its current location: expand it by taking over a section of the Jardin des serres d'Auteuil. The Jardin des Serres d'Auteuil is a gem, every square centimeter of it. 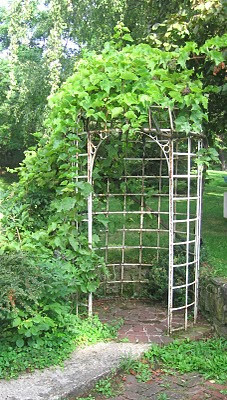 But the Mairie de Paris is apparently gung-ho on plans to let the Federation take over what it calls the "ugly part" of the Garden. The plans are to keep the antique greenhouse for show space but to remove the actual function of growing flowers. It's turning into a hot political issue. 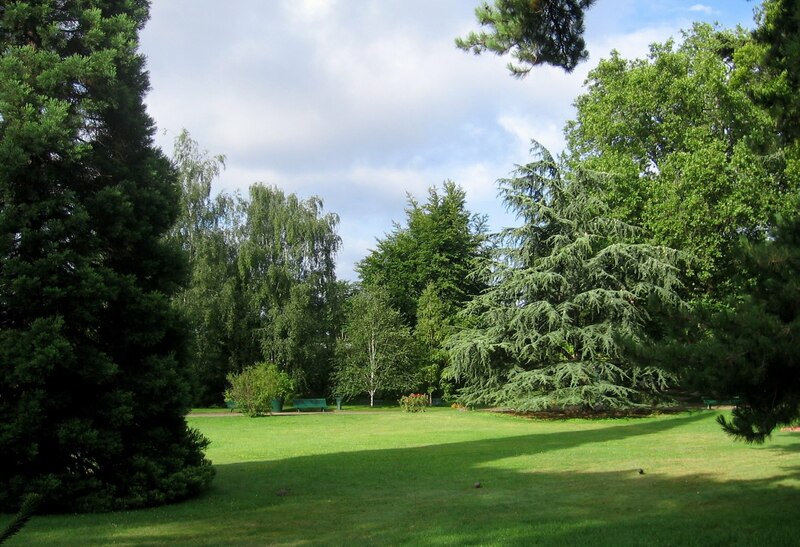 Tens of thousands of citizens have signed a petition protesting the loss of precious areas of the Jardin. Famed singer Françoise Hardy has taken on the protest as her cause célèbre. The Federation of French Tennis will decide on February 13. 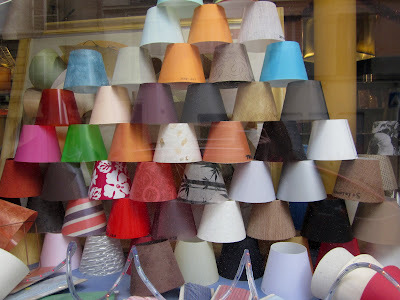 This storefront window got me thinking about lampshades. 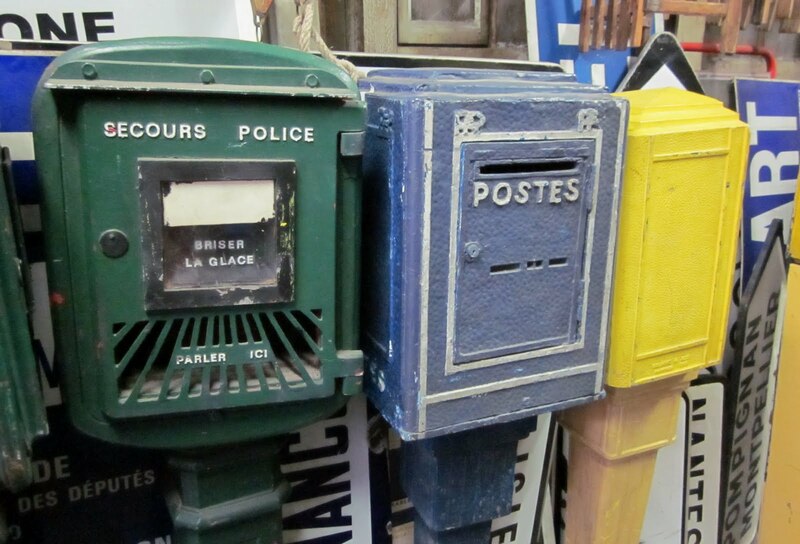 Les abat-jours. (Hmm, or should it be abats-jour? 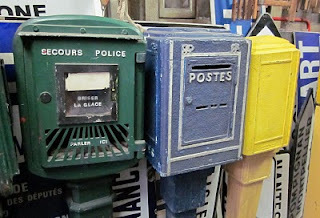 Abats-jours?) Figuring out French plurals of compound words always gives me a headache. I learned the rules way back, but I'm still flummoxed all the time. Anyway, these charming lampshades let me momentarily forget all the grammatical shenanigans. They were just delightful! We were wandering through the 11e arrondissement, doing what I like to do best: discovering side streets I've never traveled before. Oh, I was not disappointed. 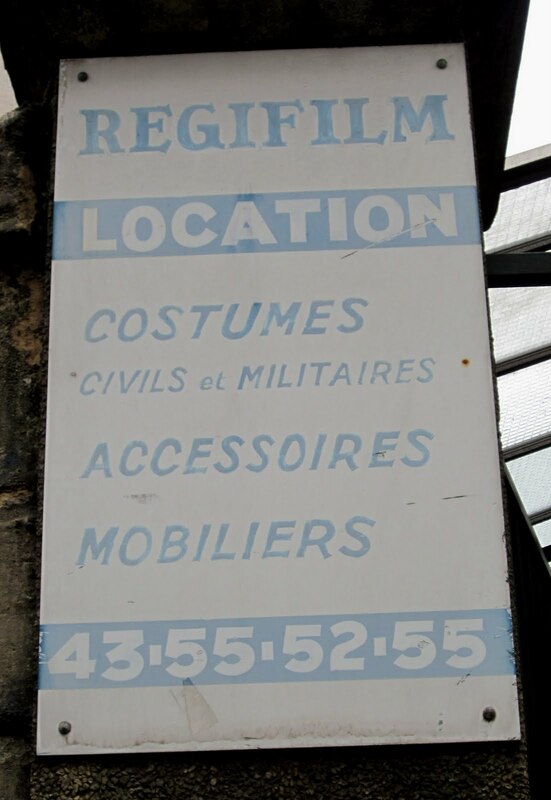 We happened upon Regifilm on rue Amelot. My idea of Paris heaven. 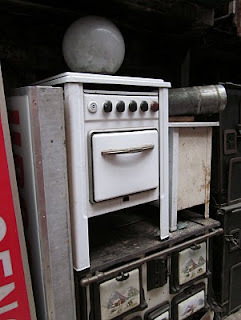 It was better than a salvage shop or a marché aux puces. What is it? Apparently, it's an agency that rents props and costumes for period films. 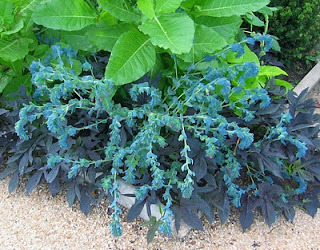 We wandered in the jumbled, crowded entrance way -- it wasn't really clear if there was an accueil anywhere, and no one seemed to mind our prowling around, so we just kept wandering further and further into the depths. 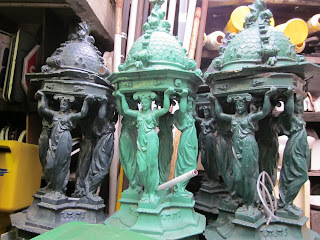 A murky maze of antique splendor. Vintage lampposts, mailboxes, street signs, fountains, barrels, lighting, kitchen appliances, mannequins. You name it. Think of any period Paris movie you've seen, and you can imagine the stock at Régifilm. Why should I have expected to have more pedestrian accidents? Because, try as I might to be mindful of the sidewalk in front of me, I find myself constantly looking up. Paris buildings above the second-story level provide an endless and rich source of architectural surprises or day-to-day drama. 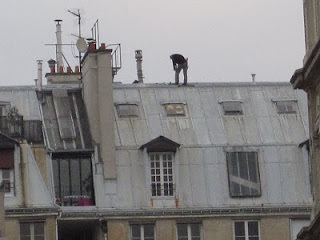 But for real drama, last week I was wandering up a narrow sidewalk in the 9th arrondissement when a flicker of movement on a rooftop caught my eye. A worker, maybe a ramoneur (chimney sweep), was walking blithely along the 8th-story edge of the mansard. My heart leapt into my throat as I watched him casually amble along the slippery tin roofline, occasionally peering over. He stopped, wrote something on a clipboard, pirouetted to another spot, leaned over. The vertigo in me was suffering vicariously, but clearly this guy was sure-footed and confident. I heaved a sigh of relief when he disappeared over the other side of the roof ridge. Not that he was any safer, mind you, but at least I knew I wasn't going to witness his untimely demise. Out of sight, out of mind. 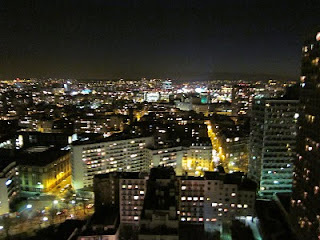 2) There are times when, eye-level viewing of the rooftops of Paris is somehow comforting and embracing. 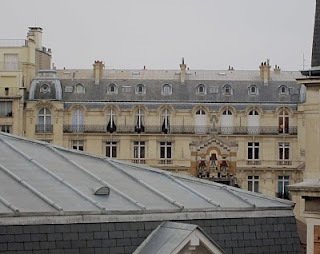 I was staying in an apartment in the 16e near place Victor Hugo, and the view from the 4th-floor balcony made me feel grounded and connected to the city. 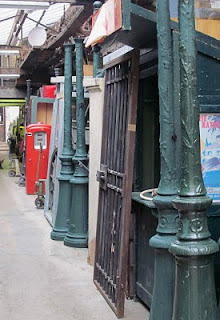 A few streets over, the curtained rounded windows; others shuttered for vacation. The chambres de bonne on the top floor: how many students living in those cramped and underheated garrett rooms? In the mid-ground, a trio of church bells. And in the foreground, an up-close view of the grey metal ridges typical of almost every Parisian mansard roof. 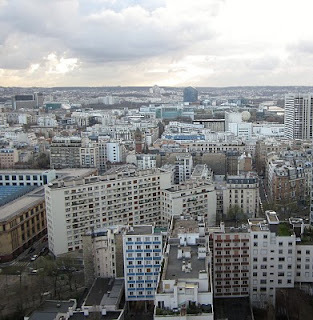 3) Then sometimes there are the spectacular views of the roofs of Paris. A friend loaned me her Paris studio in the 15e arrondissement for my last 2 days in Paris. Wow. Paris from the 23rd floor is another story (pardon zee pun). These are views of the 15e and the broad expanse of the suburbs to the west. Mostly flat, modern roofs. Bonus: do you spot the hot-air balloon from the Parc André Citroën (both photos)? There's a kind of hush. I expected it at 9 am on New Year's Day. Everyone sleeping in after all that champagne. But even by almost noon, the streets were still silent. 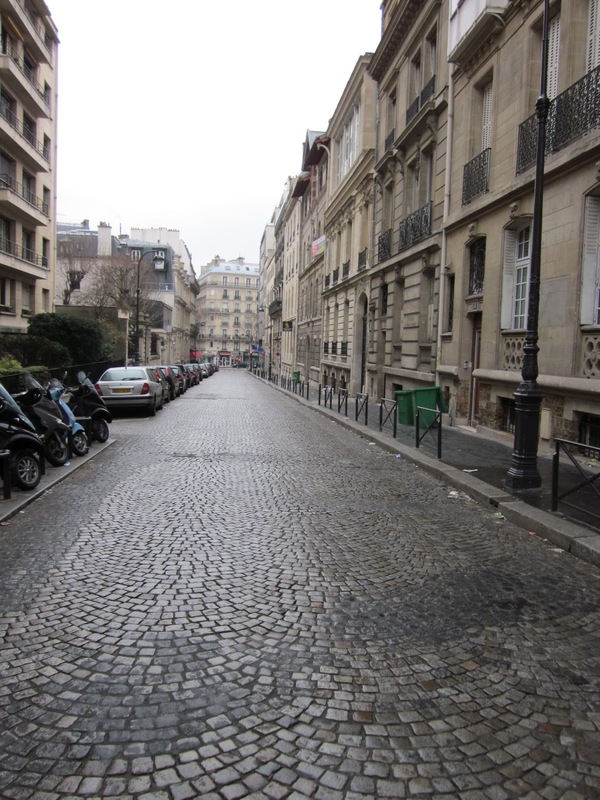 I walked to the Boissiere metro stop, and could have used the street instead of the sidewalk: not a car in sight. On a Saturday morning! The metro was free until noon. Even so, only a handful of passengers. At 2:00 p.m., our almost-empty cross-town bus from the 16e to the place de l'Opera sped through intersections and stops in record time. But by 4:30 p.m., the return trip to the 16e found the streets 100% clogged with honking traffic. Normal, quoi. Ah, Paris the mystery is always unfolding!